I find that sometimes it’s hard to initially distinguish the awesome restaurants from the mediocre ones here in Johannesburg. There’s always a lot of buzz around upcoming and newly opened places and you always have to wonder how much of that is just superficial hype. But when I kept hearing whisperings about Marble Restaurant across social media and from friends in passing conversation, it dawned on me that maybe I should start paying attention. So, with that in mind, I decided to do a bit of recon and dragged along a friend to indulge in sundowners on Keyes Avenue in Rosebank, where Marble is located. Cocktails in hand, we sat outside on the wraparound terrace as the sun set behind us, highlighting the Magaliesberg mountain range in the distance. The drinks were served in gorgeous, heavy cut glassware and the vibe was spot-on with fab music, an energetic buzz, and guests milling about inside and out. I knew within minutes that I wanted to come back and get the full experience. As you know, our rule at The Caviar Spoon is that we only cover people, places, and things that we personally love and can recommend without reservation (though in the case of Marble, you will most definitely need to make a reservation). Marble is the beautiful collaborative result born from entrepreneur Gary Kyriacou and Chef David Higgs (that’s them in the header image). While working at Five Hundred at The Saxon, the chef had become increasingly disenchanted with the fine dining scene. He felt that half of the people who were eating the food didn’t get it, and half of those people didn’t want to get it. Don’t get him wrong – Five Hundred was successful and booked all the time but he also knew it wasn’t everyone’s cup of tea. Luckily, Gary walked into his office one day with a restaurant idea he’d been toying with for about two years. Chef Higgs was immediately on board and half an hour later, they had a deal. The idea was to create a place in Johannesburg that combined sophistication with approachability – a place where you could get dressed up but not feel like you’d broken some unspoken rule if you laughed a little too loudly. And although the menu revolves around the rather primitive concept of meat cooked on fire, it’s an upmarket environment that’s far from a steakhouse. In fact, the Marble team will probably (politely) raise their hackles if you try to classify them as such! 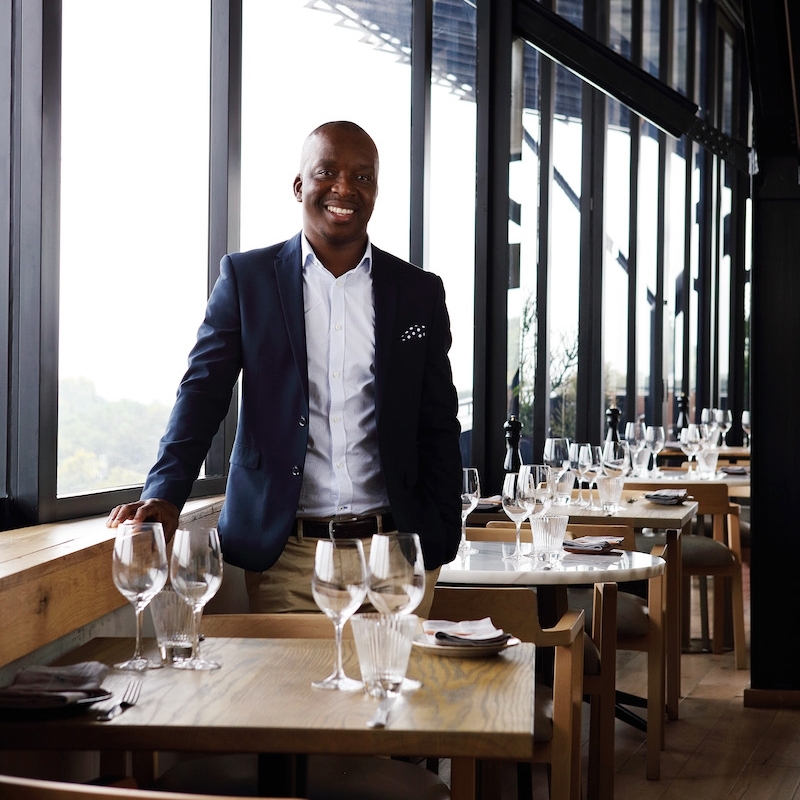 Chef Higgs likes to use a three-tiered triangle to describe Johannesburg’s restaurant scene. The tip is occupied by crisp white linen establishments like dw eleven-13 and the base is stuffed with reliable, everyday go-tos. But the middle band is surprisingly devoid of good quality restaurants that are slick and stylish without being pretentious or over budget. If you want a good cut of meat that’s been prepared well, you usually end up at some variation of a steakhouse. At Marble, business folk will start with a glass of wine and end the night with tequila shots. Groups of women will come in, relieved to finally have a place where they can enjoy a fabulous steak in a setting that’s sexier than a grill house. The restaurant nails all the senses – it looks good, it smells good, it tastes good. Add to that the sounds of cooking that meld with the background music and the voices of guests having a good time, and you’ve got a place that’s just lively enough to keep it from being too precious. Marble’s subtle decor mixes masculine and feminine elements to create a well-balanced vibe of sophistication and comfort, beautifully coordinated by interior designer Irene Kyriacou. Warm wood with cool metals and slick stone; sharp lines with organic curves; soft textures with harder ones. They all harmoniously coexist to make the restaurant seem more like someone’s well-decorated home rather than a commercial eatery. The cloth napkins have little button holes so they can be slipped onto the top button of a shirt to protect from splatters and the steak knives have smooth, olive wood handles. The food is plated on everything from earthy ceramic plates to stone slabs to wooden bowls. Everywhere you look, there’s something to discover, from the special moulded cornicing inspired by the shape of a cow’s head to the artwork commissioned from local South African artists. The striking photographs by Krisjan Rossouw pay homage to Marble with interpretations of sinew, flame, and smoke. The vibrant blue ceramic tiles by Mervyn Gers that frame the kitchen are wood-fired, as are the ceramic dolos by Peter Mthombeni, installed along the wall facing the restrooms. There’s a deliberateness to every detail and design element that ties into Marble’s roots of meat and fire. I left it up to Ronnie the General Manager to suggest the dishes that best represented Marble. After nibbling on some deliciously warm bread (served with salted butter with onion ash and a pumpkin-yoghurt-mustard-honey spread), my meal opened with a fragrant mussel dish (cooked with coconut milk, lemongrass, and fennel) which was absolutely delicious. Dessert was on the light and refreshing side, with vanilla ice cream, meringue, strawberries, and a raspberry jelly. I was already stuffed but like the glutton I am, cleaned the plate. My espresso was accompanied by a little doughnut which went untouched simply because I’m fairly certain I would have popped. The menu does have some staples, but don’t be surprised when they mix it up. Rather than deliberate seasonal changes, Marble’s dishes tend to change based on the availability of ingredients. They also try to minimize waste through cleverly using the vegetables left over from the day’s prep and service and sticking them on the coals overnight. By the next morning, they’ve all been slow roasted with a smokey flavour and are used to make the day’s soup. Good to know: The wine selection is very nice and there are in-house sommeliers, who you shouldn’t be shy about approaching for suggestions! The repeat customers here are undoubtedly drawn back by not only the food but the friendly and attentive staff who make every effort to ensure that you feel welcome and taken care of. There are 130 team members who all work together to cover food and service for the 250-seater restaurant. Ronnie is a delight and a charmer with a big smile and friendly demeanour – everything you want in a GM. I also have to give a shout-out to our server Sly who glided in and out, quietly keeping an eye on the table without being intrusive. You know how some fancy and trendy restaurants make you acutely aware that they’re fancy and trendy? Like you shouldn’t linger too long past your allotted reservation time because other important guests are waiting? Marble is the opposite. They want you to come in and enjoy yourself. If you’re not in the mood to head home after your meal, saunter over to the bar area, order another drink or two, and kick back and soak up the vibe. What’s the USP for Marble? It’s really about being sophisticated but approachable. The food here resonates with South Africans at the core and is what bonds everyone together. It’s hearty food using local ingredients that everyone’s grown up with. South Africa has really good meat – we may not have the best of everything but the country has really good beef, lamb, and variety of game that no one else has. There’s no clear answer when asked to define South African cuisine. Like other countries built on diversity, there are distinct dishes and flavours wherever you go, from Cape Malay cuisine down along the Cape to the beautiful Indian flavours in Durban to shisa nyama in Johannesburg. He remembers one guest giving him grief after Marble opened, calling him a sellout (how rude!) for leaving the fine dining scene to go stand out front in an open kitchen, cutting up meat. How could that be rewarding?? But that’s the thing. He doesn’t need things exploding on plates to feel rewarded. That feeling now comes from knowing that a majority of diners leave happy and from being able to see that they’re happy. Guests he’d only see once every six months in the fine dining scene are coming in upwards of three times a week to Marble. How he keeps the front of the house and the back of the house working cohesively? A lot of shouting and screaming, the chef jokes. Sort of. But in all seriousness, the open kitchen helps a load. When the kitchen is locked away behind doors and walls, there’s a disconnect between the chef and the diners. With an open kitchen, everyone is keenly aware that they’re being watched. It makes the kitchen staff take more responsibility and saves the servers from getting blamed for things they have no control over. There’s also a staff meal every day, and they occasionally go out together and have fun outside of work. There’s merit in everything. What does grate him a little is the whole “farm to table” concept that’s been booming over the last number of years. Not because it’s not original, but because that’s how we grew up not too long ago. Chef Higgs fondly recalls his childhood in Namibia where they would catch the fish they’d eat and his father had a garden where they could pick fresh vegetables. 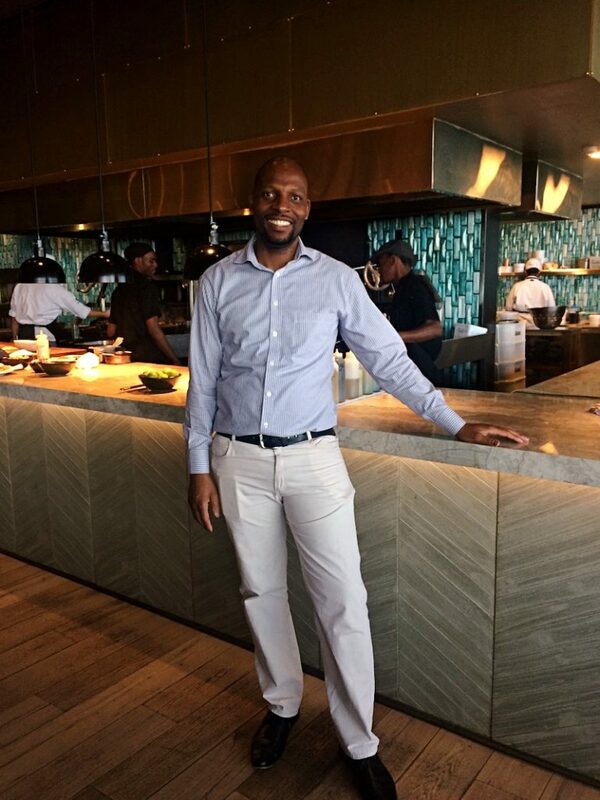 Marble relies on local products – most everything used in the kitchen is sourced within a 50km radius of Johannesburg, with the occasional item or two from Cape Town where he still has some solid supplier relationships. You need to have enthusiasm and common sense. The key quality for any person he hires is the demonstration of a will and a want to work, which unfortunately is rather rare these days among young chefs. Chef Higgs mentions how they’re being influenced by the glamourised chef’s lifestyle and promise of easy success seen on TV when in reality, being a chef is hard. The kitchen crew at Marble is a mix of young and old who play off of each other and create a good balance. The young ones rile up the oldsters with their youthful energy; the old stalwarts tell them to get on with what they’re doing. Chef Higgs points to Dumi in the kitchen as an example of one of the old guard, and appreciatively says how the man stands in front of the fire grilling for 10 hours a day, just getting it right every single time. A lot of the young cooks (who are in their mid-twenties) used to work at places like Nando’s. Chef Higgs met a lot of them through his non-profit organisation Food Cycle, which works with underprivileged youth in Diepsloot, a township just north of Johannesburg. Some will ultimately discover that working in a kitchen at a place like Marble isn’t for them but at least they’ve been given the chance to try. It’s a fantastic dynamic all around and there’s a hint of pride in the chef’s voice as he describes the team and how inspiring it is to see them all work together to make Marble what it is. He isn’t shy about saying that he’s become selfish with his time and doesn’t have the desire to indulge in fine dining anymore. Yes, those multi-course meals can be absolutely incredible to experience but “if you don’t hit it on the head for every single course, it becomes a laborious task” to have to sit through for the diner. Instead, it’s about the down to earth places where he knows the food and service are good, and where he can enjoy himself. There’s Coobs over in Parkhurst, which he commends for their passion about their products and food, and family restaurant Tortellino D’Oro in Oaklands where he’s a fan of their slow-cooked fennel bulb (when it’s in season) served with parmesan and lemon juice. A bit of a breakfast fiend, he insists that the best eggs around can be found at 4th Avenue Coffee Roasters. Outside of South Africa, NYC’s Balthazar is one of the most memorable places for Chef Higgs. Not only did he wait in line with Bono, but Balthazar ticks off everything it needs in order to stay relevant and successful: they’re always full, have a great vibe, and serve consistently good food. A restaurant’s food doesn’t have to be amazingly complex – Balthazar’s dishes are moreish and just plain GOOD. 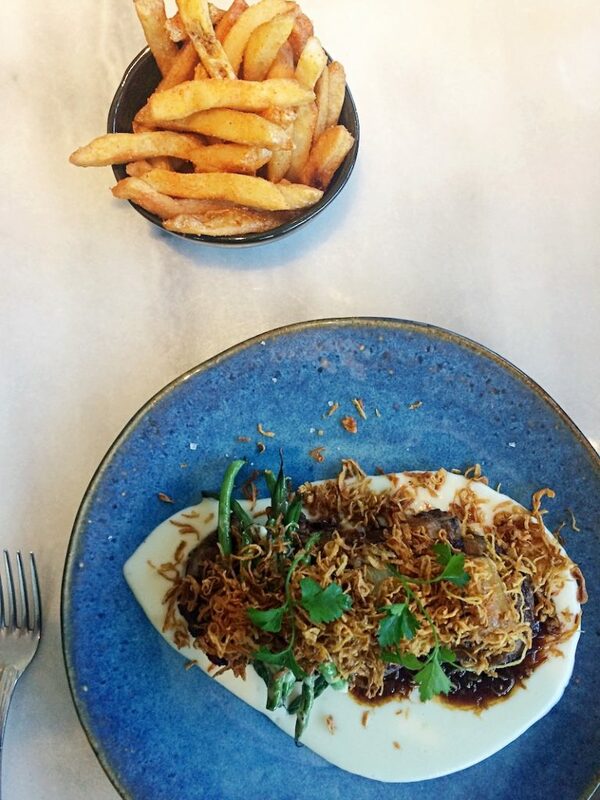 In Australia, there’s Firedoor in Surry Hills, as well as Chef Neil Perry’s Spice Temple where he was blown away by one of the restaurant’s signature dishes, “Steamed Eggplant with Three Flavours”, which is simple but mouthwateringly good. Finally, I ask Chef Higgs if he misses just being in the kitchen and cooking. These days he’s running around filming “My Kitchen Rules South Africa”, working the media circuit for Marble (and the newly opened The Butchery by Marble, located downstairs), and spending time out on the floor greeting guests. While he’s still at Marble every single day, the actual time he gets to be hands-on in the kitchen has definitely diminished. He describes how the guesthouses down in Stellenbosch have the perfect set up. Many are owned by wealthy Swiss, German, and Dutch folk who open up their eight to twelve room guesthouses for about six months of the year, and then shut down and travel Europe for the rest of the time. Chef Higgs dreams of having the same kind of thing along the Namibian coast somewhere down the line – a place that he opens and runs on his terms. But that won’t be for a while yet because he and Gary still have another project up their sleeves. Be on the lookout for another restaurant from this dynamic duo sometime August next year, if things go according to plan. It’s all rather hush-hush and I couldn’t get any details aside from the fact that it will be in Sandton, it will be completely different from Marble, and it’s based off a concept they saw in New York. Guess we’ll just have to wait and see! In the meantime, hurry up and book a table at Marble and enjoy the laid back, cosmopolitan vibe.